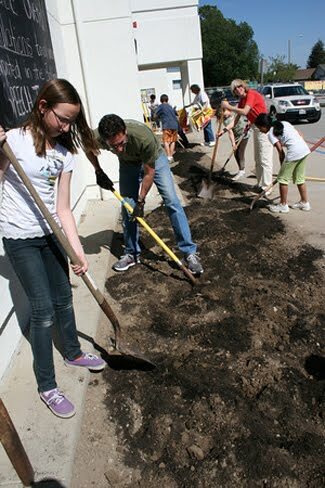 Students, parents and teachers from Camarillo Academy of Progressive Education (CAPE) in Camarillo were school gardeners last month as they transformed a patch of dirt in front of their school into a natural green area with compost donated from Agromin and drought-tolerant plants donated from Baron Brothers Nursery. Seventh graders and their teacher Kimberly Brown planned the project in class. Brown integrated science and math into the effort by having students prepare scale drawings of the area and choosing the appropriate plants as part of their ecosystem studies. The project also served as a community service project as it enhanced the aesthetics of the school. Agromin donated 25 tons of its OMRI-listed Compost 100 while Baron Brothers Nursery donated 18 one-gallon plants including Mexican sage, Indian Hawthorn, lavender and Orchid Rockrose. Oxnard-based Agromin manufactures earth-friendly soil products for farmers, landscapers and gardeners made from organic material collected locally. Baron Brothers Nursery has locations in Camarillo, Somis, Moorpark and Fillmore on 240 acres. "Seventh grade math and science came alive as students researched drought-tolerant plants, designed a landscape plan for the space using correct scale dimensions and most importantly, made a positive impact on their community by making their school campus a more beautiful place," says Brown, CAPE Charter School Pre-Algebra/Life Science teacher. "Our project was a culmination of all they had learned about plant structures and processes within a context that was meaningful to them. They realized the difference they can make for Earth Day right here at school." 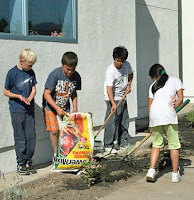 "Kids who learn about the value of soil, plants and the earth in school have a greater appreciation for the environment as they grow into adults," says Bill Camarillo, Agromin CEO. "Each bag of Agromin compost comes from renewable organic material collected from Camarillo and other Ventura County cities so the kids also got a lesson in organics recycling."